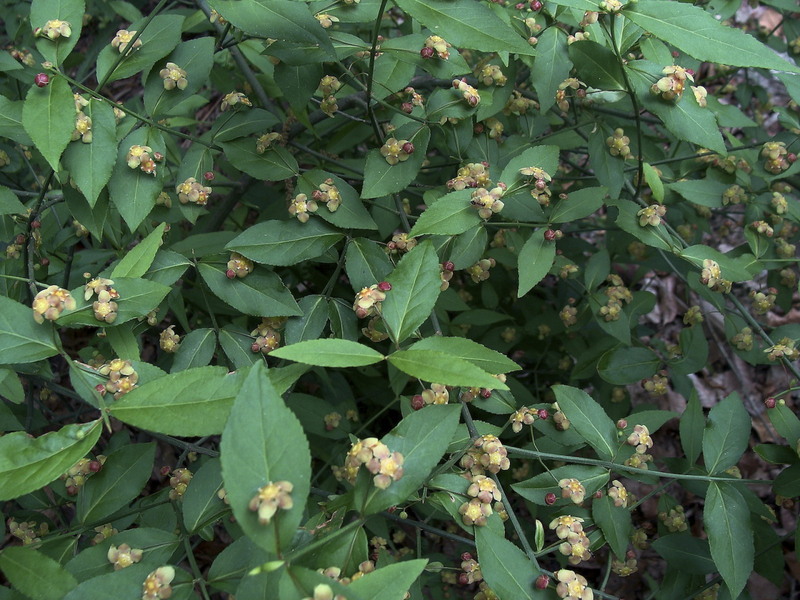 Euonymus americanus plant in bloom. Sid Vogelpohl. Creative Commons Attribution-NonCommercial License (CC BY-NC 3.0). Arkansas Native Plant Society. nps.org (Accessed 6/2018). 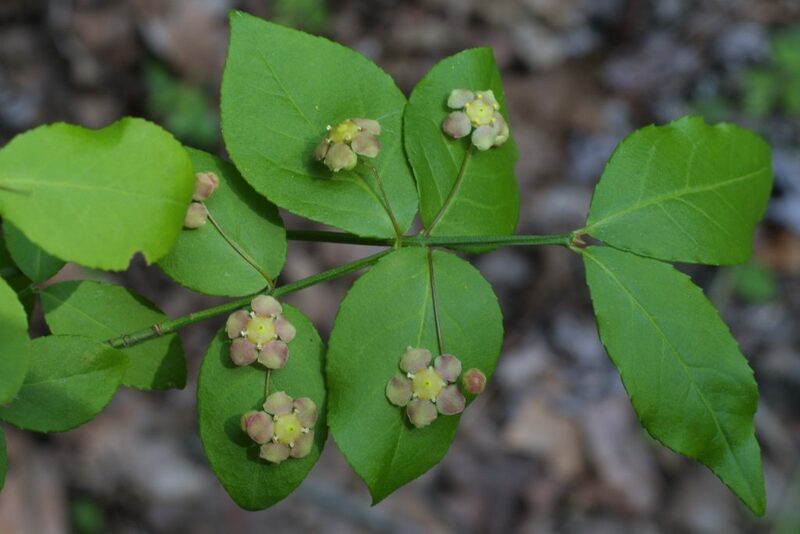 Euonymus americanus is a shrub 1-2 m tall, erect to sprawling, twigs slender, green, 4-lined, square in cross-section. Leaves opposite, stalks 0.1-0.3 cm long, narrow, 3-4 cm long, fall color red. Euonymus americanus leaves and flowers. discoverlife.org (Accessed 6/2018). Flowers greenish-purple, 5-parted, 1-1.2 cm wide, petals narrowed at base; May-June. 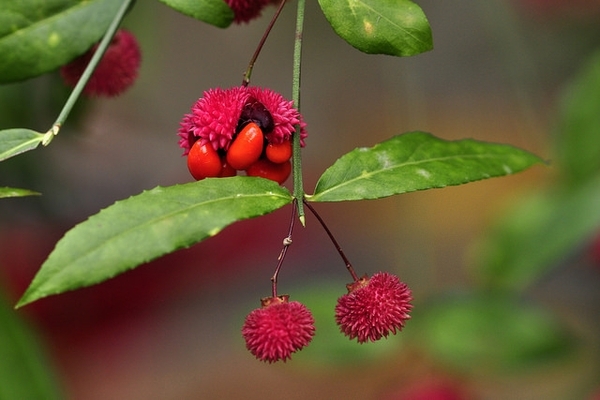 Euonymus americanus fruit. J. Michael Raby. NC Extention. plant.ces.ncsu.edu (Accessed 6/2018). Fruit a warty, pinkish capsule, opening to reveal seeds covered by bright scarlet, fleshy arils, pulp lipid <10% (White and Stiles 1992), Aug.-Oct., bird dispersed. Frequency in New York City: Very infrequent; NYS rare, S1, threatened. Now planted in some restoration sites. Habitat: Moist woods, soil pH 6-7.5. Very tolerant of shade. Moderately tolerant of flooding, soil compaction. Intolerant of salt, drought, Susceptible to Euonymus scale (Hightshoe 1988).